The Lost Medallion is a new family movie about the value of friendship and self-confidence. It begins with Daniel Anderson (Alex Kendrick-Facing the Giants, Courageous) visiting the home of an old woman who fosters many children. A little girl asks him to tell them a story. He agrees, and incorporates into his tale the some of their names and struggles. His story is about a young boy named Billy Stone (Billy Unger), the son of an archaeologist. Mr. Stone’s dream is to find a rare historical item known as The Medallion, which is said to grant wishes. According to legend, this medallion was in safekeeping of a kind and noble king who used it for the good of his people, until his son lost the magic stone which enabled its power. Because of the loss of the medallion, an army led by the cruel King Cobra (Mark Dacascos) overtook the land. The good king buried the medallion to keep it from the evil ruler. Even though it’s Billy’s dream to follow in the footsteps of his father, he is told to stay away from the digging site. Billy strives to prove his worth, so with the help of his orphaned friend Allie (Sammi Hanratty), he goes to a nearby forest in search of the medallion. When they they actually find it, he realizes he has the other piece of the medallion–it’s an old stone his mother gave him just before her death. Once the stone is put back into the medallion, it begins granting wishes again. When Billy suddenly wishes that none of this had ever happened, he and Allie are transported back into the medallion’s golden days. What follows is a story of adventure and courage. While this was a family friendly movie with good morals, I found its storyline to be rather weak. The evil King Cobra has a poisoned nail on one of his fingers, which he uses to stab his enemies in the neck. He also has a bottomless pit into which he throws his enemies. Some parts which were meant to be funny, I found to be just crude humor. My thirteen-year-old sister watched it with me, and said it resembled a family-friendly Indiana Jones. It’s a little difficult for me to say I enjoyed this movie because it’s directed to a younger audience. The movie does contain good morals, and the children learn valuable life lessons along the way. The medallion is said to only grant wishes to the pure of heart. Parents should discuss one scene after the movie: Allie is told that even though her mother thought she was an accident, God didn’t think of her as one. It might bring up questions a young person is not ready for. The film also addresses humility as opposed to pride, and that in order for things to work out, you have to work together. I also enjoyed the tropical island setting; some of the shots were breathtaking. 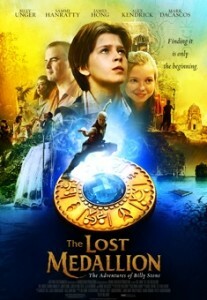 Overall, The Lost Medallion was an okay movie for a younger audience, but it’s not one I would personally pay to go see. To learn more, visit the website here.